Starting today, November 1st, 2012, Stampin’ Up! has an AWESOME promotion for you all!!! Promotion Details: Hostesses who hold a minimum $450 party during the promotion period will receive a FREE collection of Classic Stampin Pads-they can choose from Brights, Subtles, or Regals-a $49.95 value! Plus, the free ink is in addition to the regular hostess benefits-INK-redible! But wait, that’s not all!!! 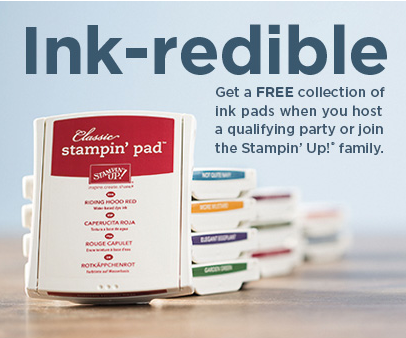 If you join the Stamp-Patty’s team during this same time period (Nov. 1 – Dec. 16, 2012) you too will get a complete collection of Classic Stampin pads absolutely FREE! This is in addition to the $125 worth of SU! product that you get to select for only $99!!! What are you waiting for? You need to join my team today!! !